English worksheets > contributions by MajaV. 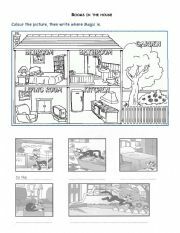 Pupils colour the picture of the house, then can talk about it. They practice writing,reading and speaking. 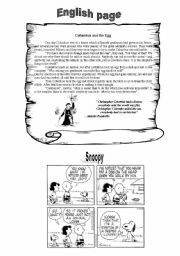 This is a short story about one event in Christopher Columbus´ life. I find it very interesting and I hope you like it too! 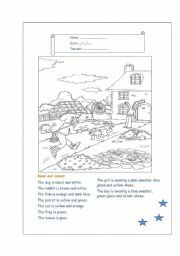 An interesting worksheet which includes pets, clothes and colours. Kids will have fun finding the animals and colour them. I hope you like it! 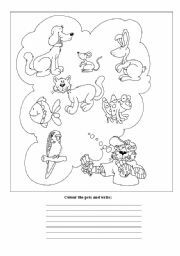 Children need to colour the pets and write which colours they´ve used! In this worksheet pupils choose verbs from the box, make a word order and do exercise for have to as a modal. 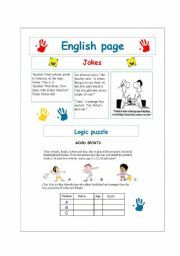 Two different types of grammar lessons made in one worksheet. I think it´s very interesting and funny article. I´ve used it for school newspaper. This test is for those pupils who use Join In 1 (Cambridge course). It´s made to check comprehension of words, actions, regular and irregular plural noun, that we learnt in the first four units. 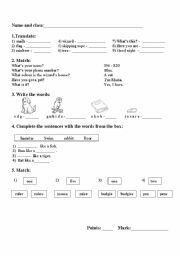 This worksheet I´ve used in 5th grade, and children loved it.